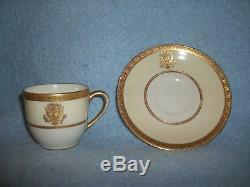 Demitasse cup and saucer from the original 1918 Woodrow Wilson service used at the White House! They have normal wear due to being used at state functions. 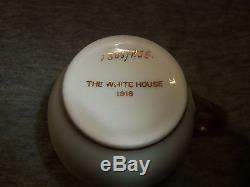 The cup and saucer both have only "The White House 1918" printed on the bottom giving further proof of originality. 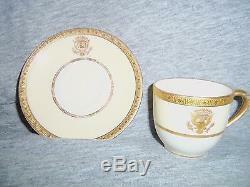 They were made by Lenox which is embedded on the bottom of the cup. An identification letter and number of "1306/P55" is hand-written in gold on the bottom of the cup as well. The cup and saucer have no cracks or chips. The photos are intended to be updated. 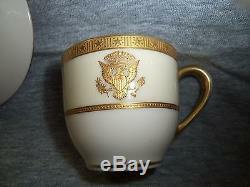 The item "White House China Demitasse cup and saucer from 1918" is in sale since Monday, March 19, 2018. This item is in the category "Pottery & Glass\Pottery & China\China & Dinnerware\Wedgwood". The seller is "brunojrb1956" and is located in Hurlock, Maryland.